Culver City’s first house of worship, St. Augustine Church began when the Figueroa family donated land in 1883 in what was to become Culver City, when Washington Blvd. was just a dirt road. In 1887 a modest wood framed church that sat 200 was built, and in 1922 it was expanded to seat 500. On Christmas Morning 1957 the current church opened, which seats 1,070. Before Temple Akiba was built, Culver City’s Jewish congregants held high holy days in Veterans Memorial Auditorium. The initial sanctuary on Sepulveda Blvd. was dedicated in1955, and its latest renovation, with a new entryway courtyard and a sanctuary including windows for the first time, was completed in 2015. Culver-Palms United Methodist Church has enjoyed a prominent place on Sepulveda Blvd. next to the YMCA, First Southern Baptist Church is located in Culver City’s earliest neighborhood (just a couple of blocks from City Hall) and Grace Evangelical Lutheran Church on Overland is just a few blocks from Culver City High School. Early Grace Evangelical congregants met at the Scout Hut on Culver Blvd. before its members built the original church (now the Fireside Room) by hand, including pews and pulpit, in 1948. The main church, also built by church members including the wrought-iron, was dedicated in 1952 and seats 220. Recent history has not been kind to Culver City Seventh-Day Adventist Church on Washington, which has been hit by cars four times, and Culver Community Church on Washington and Sawtelle has also had to deal with vehicle damage. Culver City Presbyterian Church, built circa 1950 and able to accommodate 224 with another 50 in the loft, has thrived despite the 405 Freeway having been built just a block away. Culver City’s King Fahad Mosque, with its 2,000 worshiper capacity, marble façade, Turkish hand-made tiles, and 72-foot-high minaret, opened in July 1998. The mosque demonstrates Culver City’s diversity, both in terms of demographics and religious tolerance. When a group gathered in 2006 to protest at the mosque over unfounded connections to the 9/11 attacks, clergy from other faiths stood arm-in-arm to protect the King Fahad. Amidst today’s hustle, bustle, and gridlock, it is nice to think back to a time before cars, when there were clopping hooves instead of purring engines, and the only horns were for music, or a bugle’s call. Reveille would have been the morning clarion call at Camp Latham, the Civil War encampment near Overland and Jefferson where 2,000 soldiers and probably horses were stationed between 1861-1862. But it was the Spanish missionaries (whose route El Camino Real is now marked with bells like the one found in the median at Sepulveda and Jefferson by Petco) that brought horses to Southern California, beginning with the Portolá expedition of 1769. Breeds such as the Chilean Criollo, Puerto Rican Paso Fino, and American Paso Fino begat the California Vaquero horse, and vaquero horseman culture, which was the beginning of the American working cowboy. 1819 saw our area’s most important equestrian event when Agustín Machado, following California use permit law, rode as far and wide as he and his horse could manage from sunup to sundown, claiming what was to be known as Rancho La Ballona. Machado was famous as a horseman, for horse-trading, and grand fiestas for each family wedding and each birth of his 15 grandchildren, which always included horseracing and rodeos. The latter tradition may be the reason we have Rodeo Road (soon to be renamed Obama Boulevard), which begins in Culver City. In 1922 Harry Culver founded the Pacific Military Academy. First located on Washington Boulevard and later moved to Cheviot Hills, it is where Harry taught his daughter Patricia how to ride sidesaddle, and it is also where the photo here of Culver on horseback was taken. Besides transportation and military use, horses have always been used for sport and gambling, and Culver City was not immune. The city’s horse racing track opened in 1923, but by December 1924 it was replaced by “Los Angeles Speedway.” Eventually the infield became Carlson Park. Horses were a huge part of Culver City’s movie history, from Thomas Ince’s silent Westerns to Gone With The Wind’s carriage and warhorses. During the 1930s-50s Charlie Flores was the livery stable owner who leant his horses to MGM productions. 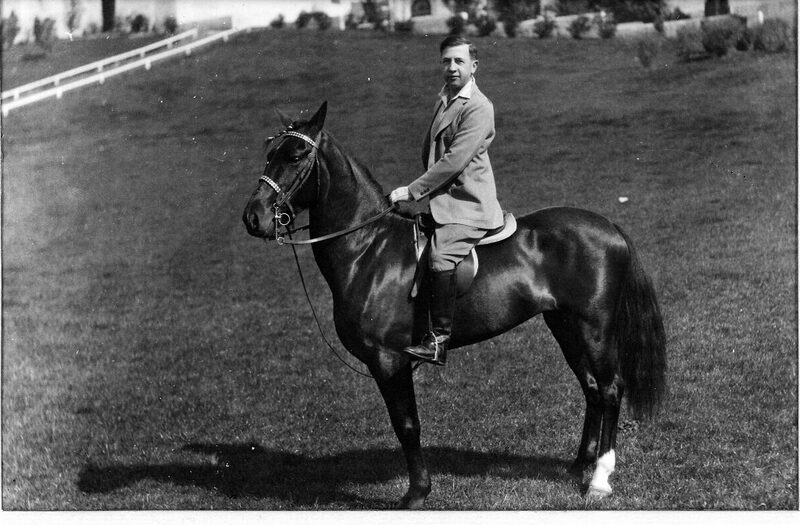 In the 1950s, during the early days of Fiesta La Ballona, descendants of Culver City’s first families paraded on horseback. This tradition remains to some degree with the pony rides at the current day Fiesta. Today, horse property in the Los Angeles area is few, far between, and disappearing fast. One day when the oil in Baldwin Hills dries up, that land should by all rights become a park. Perhaps with public stables named after Charlie Flores, and riding trails named after Agustín Machado. As we celebrate Culver City’s Centennial, it’s natural to wonder how the city came to be, and what it was like before 1917. A quick history of pre-incorporated Culver City: Home to the Gabrieliños (nee Tongva) native peoples, it was part of the ranchos that subdivided present-day Los Angeles County in the early 1800s. Barley, beans, and grapes were the major cash crops, along with cattle and horses, but soon motion pictures became the city’s industry. Harry Culver had already pinpointed the area that would make his real estate fortunes due to it being halfway between downtown Los Angeles and Abbot Kinney’s “Venice of America” seaside resort, with the Pacific Electric Railway “Short Line” depot at Venice and Bagley Avenue already in place, and announced his plans for a city at the California Club on July 22, 1913. Then Culver famously saw Thomas Ince filming a Western along Ballona Creek, convinced Ince to move his studio from Pacific Palisades to Washington Blvd. and Jasmine in 1915 where the colonnades of Ince Triangle Studios still stand, and “The Heart of Screenland” was off and running. 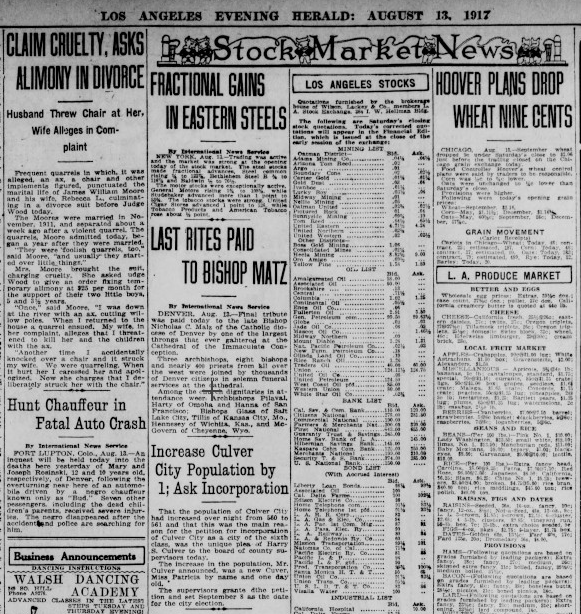 To hear the Los Angeles Evening Herald tell it, the impetus for Harry Culver to seek a vote of incorporation for his new city wasn’t to found a city bearing his name, to make his fortune, or to improve his standing in the region. Instead, it was the birth of his daughter. By 1918 Triangle Studios were sold to Samuel Goldwyn, with Ince already having moved to what is now The Culver Studios, with “The Mansion” (or “Colonial Administration Building”) the first to be built on the lot, and in 1919 Hal Roach built his studio on Washington across from what is now the Culver City Expo Line station. In 1924 Goldwyn Pictures merged with Metro Pictures and Louis B. Mayer Pictures, forming Metro-Goldwyn-Mayer Studios, better known as MGM. 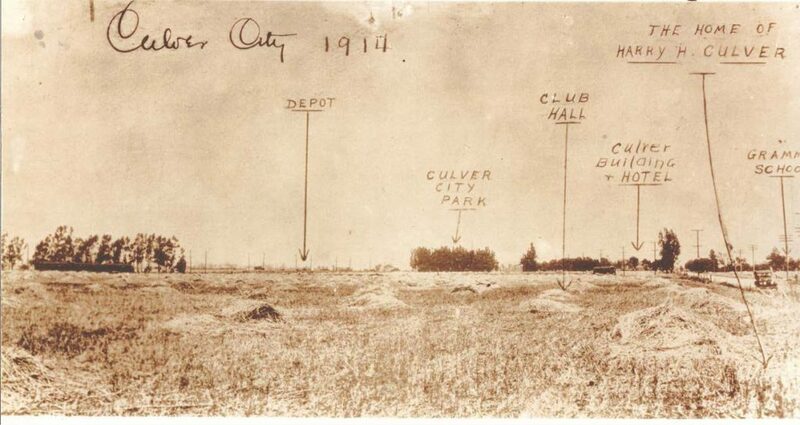 As for what Culver City was like prior to incorporation, the best we have is this photo, on page with 1914 written on the photo itself by an anonymous cartographer. Culver Grammar School, noted on the right of the photo, is now home to the Culver City Unified School District offices, next to Linwood E. Howe Elementary. Harry Culver’s home was originally located on Delmas Terrace before it was moved to Cheviot Hills. The Culver Building and Hotel of course is the iconic triangular building at Culver and Main streets, which opened as the Hotel Hunt in 1924. 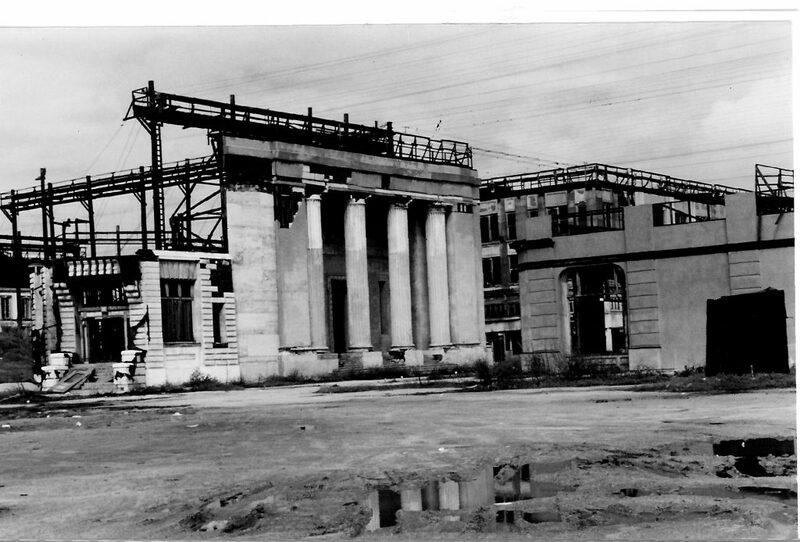 “Club Hall” became the Legion Building, built in 1930, which still stands on Hughes Avenue, just south of Venice. Culver City Park is what’s now Media Park, near Venice and Culver boulevards. And the depot is what’s now the Expo Line’s Culver City Station. Just as it’s hard to imagine Culver City back when it was barley and bean fields, it’s impossible to conceive of what the area will look like in another hundred years. 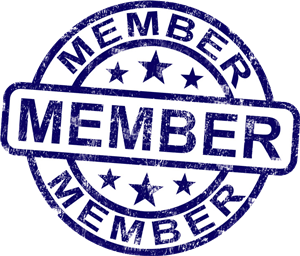 We can only hope that it will still be going strong, and that its magnificent history will continue to be preserved and appreciated by people such as yourselves, our most valued members of the Culver City Historical Society. You can always tell who’s new to Culver City by their mispronunciations of two of our most important streets: Duquesne (Doo-KEZ-nee, instead of Doo-cane, which is the proper French pronunciation) and Sepulveda (Sep-pull-VEE-duh, instead of Seh-PUL-vih-duh, which is the proper Spanish pronunciation). Duquesne Avenue runs through the heart of Downtown Culver City, and Sepulveda Boulevard is one of the longest streets in Los Angeles County. Who were these streets named after? Spanish Armada for France, and against the Dutch for Sweden. During the Franco-Dutch War, he fought against the combined Dutch-Spanish fleet in the Battles of Stromboli and Augusta in 1676, which resulted in the death of Dutch Admiral Michel Adriaanzoon de Ruyter. Duquesne was only able to ascend to lieutenant general because of his steadfast refusal to convert from being Protestant. 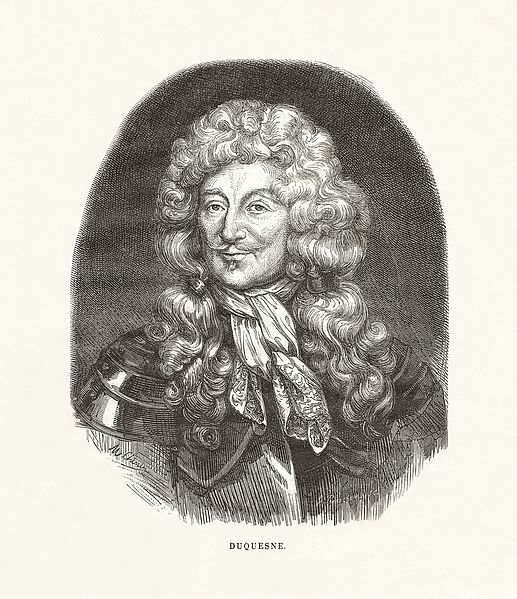 His grandnephew Michel-Ange Duquesne de Menneville was a Governor General of New France, founded Fort Duquesne at the confluence of the Allegheny and Monongahela rivers and is the namesake of Pittsburgh’s Duquesne University. Francisco Xavier Sepúlveda y García (born 1742 in Villa de Sinaloa, Mexico) was patriarch of the Sepúlveda family, who the street was named after. 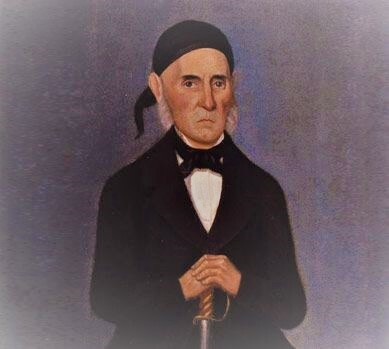 In 1839 his son Francisco Sepúlveda (born 1775 in Sinaloa) was granted 33,000 acres of the Rancho San Vicente and Santa in recognition of his services to the Mexican government. Eventually, all thirteen of Francisco Sepúlveda’s children controlled large ranchos, with María Ramona Sepúlveda marrying José Agustín Antonio Machado, one of the grantees of Rancho La Ballona, which included present-day Culver City. So the next time you hear these great street names mispronounced, you can school any newcomers with a little history too. In June 1960, when Rich Langsford was 12 years old, he got to do what many Culver City residents only dream of doing — go up in the tower of the Veterans Memorial Building. Fortunately for us, he brought a movie camera. In town for his Culver City High School 50th class reunion in September, this Class of ‘66 alum presented the Historical Society with a DVD transfer of the film, which was shot on a Kodak Brownie 8mm camera. 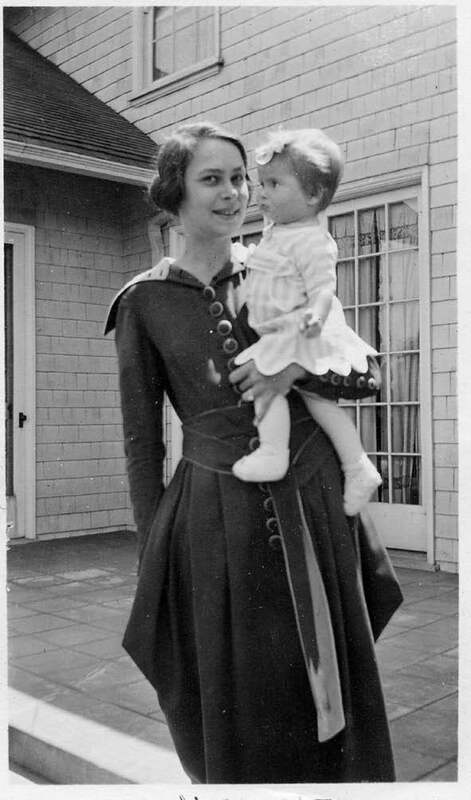 The story goes that Rich’s mother, Marjorie, worked at MGM, first in the script department and later as personal secretary for Rod Serling, a screenwriter best known as creator and narrator of The Twilight Zone television series. One day Rich joined his mother for lunch at the Tower Restaurant, which once operated inside the Veterans Memorial Building under the tower, and he just so happened to have his camera with him. Rich isn’t sure if his mother made an appointment to go up the tower’s elevator or if she just asked nicely, but somehow they were able to spend some time enjoying the view. In 1960 that view would have included a look into MGM’s Lot 2, which included backlot mainstays like “New England Street,” “Grand Central Station”, “Small Town Square,” featured in films like The Philadelphia Story, Meet Me in St. Louis and, yes, TV shows like The Twilight Zone. These days Lot 2 is where the Culver City Senior Center and the Studio Estates neighborhood are located. If you would like to see Rich’s 1960 view of Culver City from Vet’s Tower, the DVD can be screened at the Historical Society’s Archives and Resource Center during open hours.